PHOTO BY JONATHON BIRD Bellevue’s Richard Stombaugh is double teamed by Columbian’s Tyrin Smith and Chase Frankhauser during the first half Friday in Tiffin. Bellevue coach Ed Rich said it was Richard Stombaugh’s best game of the season. And without star guard Trey Ruhlman, the Redmen needed it Friday at Columbian. 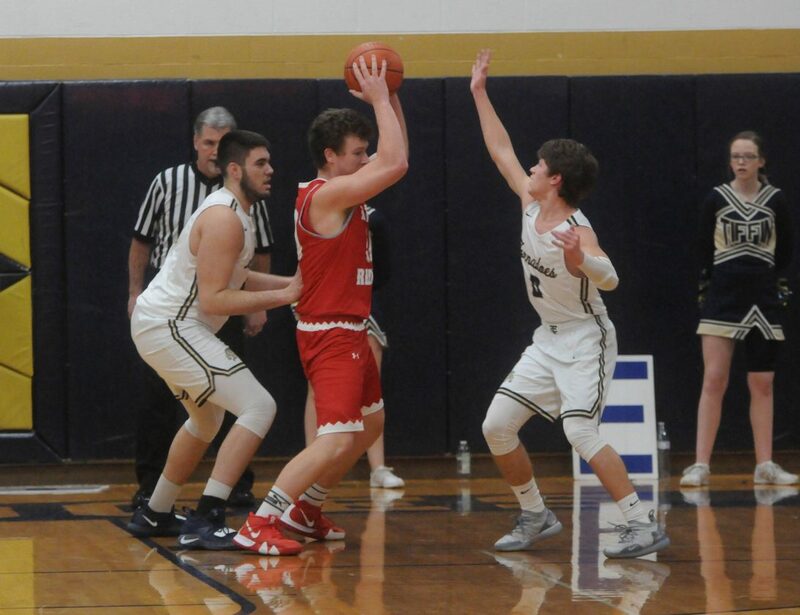 Stombaugh had 16 points and seven rebounds as Bellevue got past Columbian 51-41 in Sandusky Bay Conference play. The Redmen improved to 6-10, 2-6 in the SBC Lake. Both conference wins have come against Columbian. Stombaugh was outstanding under the basket. Four of his seven field goals — and half his points — came on baskets that came off teammates’ misses. “Played hard, played physical,” Rich said of the 6-2 senior post. That wasn’t easy Friday, as for much of the game, Stombaugh was matched up against a fellow senior, TC’s Tyrin Smith. Smith had a strong game too, with 13 points. Columbian stayed right with Bellevue most of the game, trailing by a single point at the end of the first quarter and at halftime. The Tornadoes also erased a 10-point third quarter deficit, as Smith and Bryce Burns combined on a 10-0 run to tie Bellevue at 33 with 2:11 left in the period. But the Redmen — on a Stombaugh stickback — regained the lead and started an 11-3 run that the Tornadoes were unable to counter. Another key was the rebounding and defense of Caleb Marshall. He finished with 10 points, and made only a single free throw in the final quarter. But he grabbed eight of his game-high 13 rebounds, and was a big reason for Columbian being held to eight points in the fourth. Reaves had nine points to go with six boards, while Brockington was held to two points and Burns scored seven. The Tornadoes slipped to 2-15, 0-9 in the SBC Lake. The bright spot for TC was Smith, who made three of Columbian’s seven 3-pointers. For Bellevue, Garrett Vickery had eight points, as did Chase Eisenhauer.